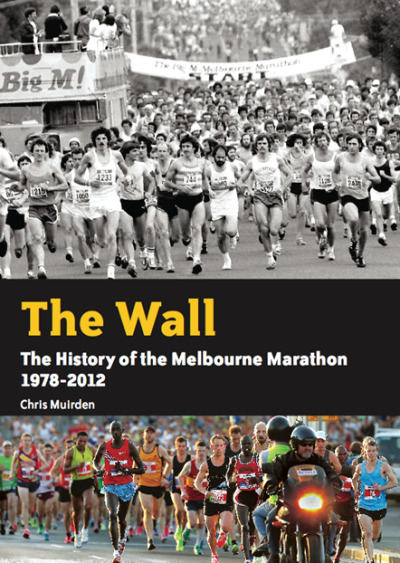 • Author Chris Muirden has a long association with the marathon and is a Herald-Sun journalist. Note: The book was launched December 3 by Steve Moneghetti. Recommended retail price $54.95. Order direct from Chris via email at muirden@iprimus.com.au. It is also available at Dymocks book stores – seen in Camberwell and Bendigo, so probably available everywhere. On 11 August, 1978, a promotional article appeared in The Sun, announcing the Big M Melbourne Marathon would take place. Ron Clarke, local distance star Adrienne Beames, Brian Dixon, Olympian Judy Pollock and Lord Mayor Rockman were pictured running down a Melbourne street in front of a tram decked out in Big M milk posters. Shortly after 3MP, a popular radio station based in Frankston, began to run advertisements about the race. Dixon and his committee were hoping to lure some of the sport’s big names, including Americans Bill Rodgers and Frank Shorter and New Zealand’s Kevin Ryan. This may sound a far-fetched prospect now, given the money required to woo top internationals, but the initial years were the last before amateurs were allowed to accept prizemoney, thus a lavish trip Down Under had some appeal. According to Rick Pannell, they went close to luring 1972 Olympic marathon champion Shorter, who would have come but for a knee injury. “He wants to come, but he does not want to do the wrong thing by us. He must be admired for this”, Pannell said in the lead-up to the first race. 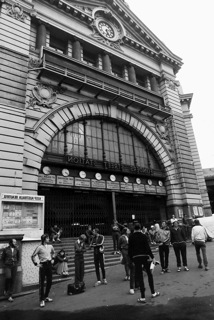 Shorter did eventually front for the Melbourne Marathon, but not until 1994 when he was 46. Ted Paulin, who was still working for John Fairfax and the Age in advertising, and Win May set up a Melbourne Marathon office at Olympic Park at the old medical office in Swan St with Pannell. May handled the entrants, Paulin the administration and marketing, Pannell the finance and media, while Fred Lester looked after the volunteers and course logistics. “You can imagine what it was like first year and just knowing nothing and trying to put it together. We had virtually no money and I don’t think any of us got paid. We were just excited about the event”, Paulin recalled. There was also a mad last-minute flood of entries with more than 500 traipsing to Olympic Park to pay $5 and collect their race bib on the last day of entries on October 20. That took entries to just over 2500. A look at race photographs from the big day two weeks later indicates there were plenty of unofficial competitors on the start line without race numbers. The race was to start in Foote St, Frankston, and finish at the Town Hall in Swanston St with the point-to-point course presenting several logistical difficulties. 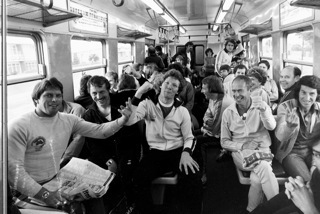 Two trains were arranged to take competitors from Flinders St to Frankston near the start line. Excited chatter on Platform 7 turned to worried talk when the special 7am expresses arrived about 30 minutes late. When Paulin learnt of the delay, he immediately consulted Lester and the start time was moved back. Competitors assembled at Delacombe Park and used toilets at Frankston High School. They dropped clothing bags in trucks and then headed to Foote St, where a start banner had been hung across the road between two power poles. About 50m down the road, a double-decker bus, decked out in Big M posters, was parked, providing the media with an elevated shot of the start. There was no music, no compere, just Fred Lester with his megaphone. At 9.15am, Brian Dixon, who would also run the race, climbed a portable crane and fired a huge rifle to signal the start. Melbourne had its people’s marathon. Alan Cruse and Steve Bates are two of the runners in the train photograph: let us know if you can identify any more runners. April 2016: Hamish Cross has identified his father, Tom Cross, in the photograph.